Smt. 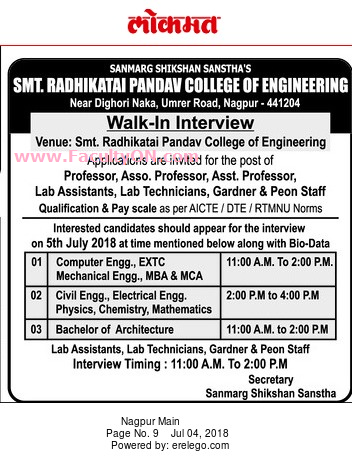 Radhikatai Pandav College of Engineering, Nagpur has advertised in LOKMAT newspaper for the recruitment of Professor / Associate Professor / Assistant Professor Plus Non-Faculty jobs vacancies. Interested and eligible job aspirants are requested to walk-in on 05th July 2018. Check out further more details below. About College : Smt. Radhikatai Pandav college of engineering was established in the year 1999. The mission of the institude is to provide world class engineering and technocards of high professional standard with human value and absolute discipline to serve the society with the integrity at large having pride for our nation. The institude is affiliated to the rashtrant tukdoji maharaj Nagpur, university Nagpur. Qualifications: As per AICTE / DTE / RTMNU norms. Salary: As per AICTE / DTE / RTMNU norms. How to Apply: Interested and eligible candidates are requested to appear for Walk-in interview along with their CV, originals & copies of certificates and a recent PP size photo to the following walk-in address.